Have you ever witnessed the turf wars that can occur between two coworkers who are forced to share a workstation area? Whether it’s a long bench style table or two desks shoved up against each other, one employee always seems to take up more than his or her fair share of space. Their piles of paper and office supplies keep creeping over the line into their neighbor’s territory. This can lead to a lot of angst on the part of the coworker whose space is being encroached upon. The passive aggressive behavior on both sides can get really out of control, raising the tension in the workplace to unbearable levels. Isn’t it time to put a stop to the petty feuding once and for all? 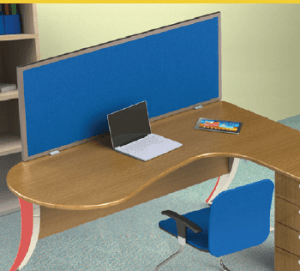 With desktop mounted privacy panels, your employees can set firm boundaries separating their workspaces. They won’t be in your office complaining about how their coworker’s stapler is 2” over the line into their desk space. Just like good fences make good neighbors, our desk dividers make good coworkers.